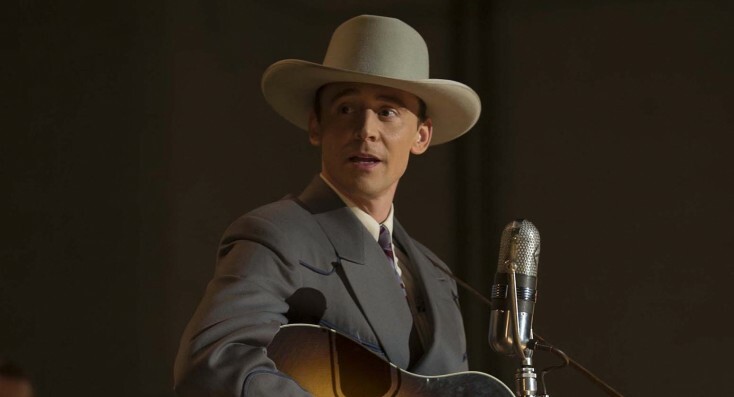 (l-r) Elizabeth Olsen as Audrey Williams and Tom Hiddleston as Hank Williams in I SAW THE LIGHT. ©Sony Pictures. CR: Sam Emerson. Hiddleston, 35, plays the brilliant but self-destructive musician and singer, whose relationship with his star-struck wife Audrey (played by Elizabeth Olsen) created the backdrop for turbulent life that inspired him to write some of his best-known songs in the 1940s and 1950s, before his untimely death at age 29. Hiddleston had to learn how to play guitar and sing like the Alabama native. At writer-director Marc Abraham’s insistence, lip-synching was out of the question, so Hiddleston spent a month prior to production working with the film’s executive music director Rodney Crowell, a hit recording artist in his own right, trying to get the look and sound of Williams just right. The actor stayed with Crowell in Nashville, immersing himself in the crooner’s music, rehearsing and recording Williams’ classics including “I’m So Lonesome I Could Cry,” “Cold, Cold Heart” “Honky Tonkin’,” and even songs that aren’t in the film. Tall and lanky like his on-screen character, Hiddleston spoke about taking on the American icon, whose influence on other musicians continues to this day. Q: Has playing this role changed your perspective of country music? Hiddleston: Yes it has. What I find interesting about American country music is essentially I understand it now is folk music. Folk music, wherever you are, is an expression of the authentic soul of a country, whether that’s Scottish folk music or Irish folk music or English folk music or Spanish folk music. When you get under the skin of a country’s folk music, you start to understand their instinctive rhythm. When I went to Nashville and spent some time preparing for this, I started to understand country music is America’s folk music, and it comes from the blues. The blues is so deeply engrained into the American soul. I had a whole new appreciation for it, which has been really thrilling, especially because Hank is right in the center of it. He’s a cornerstone in the history of it. He was taught the blues and he made it is own. Then people who came after him took him as an inspiration to make their own music. Bruce Springsteen, Bob Dylan and Johnny Cash—all these people for whom Hank is the brightest star in the firmament. Q: What’s been the reaction from audiences you’ve seen this with? Hiddleston: We had a really fun screening in Nashville in October. A lot of people came out to watch it. Myself and some of guys in the band did a little performance afterwards and it was really fun. They seemed to really dig it. Nashville’s a tough crowd, and they wouldn’t have stuck around if they hadn’t enjoyed it, so yeah, it’s been fantastic. Q: Can you tell me anything about your musical history? Did you sing with the choir at school? Hiddleston: I didn’t. I sang before at school, but I was never a choirboy. I was in big chorale groups. I was never in a band. I’ve only sung for my own; I sang in the shower, basically. I never sang professionally or anything like that. This is my first time. Q: What were your favorite thing that you visited in Tennessee while you were shooting this film? Hiddleston: I basically put myself under house arrest in Rodney Crowell’s house, because any time not spent working was time I feared I would never get back. I did go to the Americana Music Awards. Jason (Isbell), who won album of the year and songwriter of the year got up and accepted his award, and the first thing he said was, “Happy Birthday, Hank.” It was my first time in the Ryman Auditorium. I couldn’t believe the coincidence. My first time in the modern church of country music was Hank’s birthday, and the 2014 winner was thanking Hank first off the bat. We went over to Tootsie’s and into the honky-tonks, and every wall is pasted with a mural of Hank Williams. I loved it. I really loved Tennessee. That’s the thing that I think many Americans don’t imagine and why would they, is that for a European the countryside of a place like Tennessee is incredibly exotic. It doesn’t look like anywhere in Europe. It’s the America we’re indoctrinated to believe in, of horse country and leaves on the trees and picket fences. It was very beautiful. I loved it there. Q: I know this film was made with a real eye toward authenticity. What were the tools you were able to access to bring your own creativity within those confines? Hiddleston: The most fascinating aspect of acting is finding the common ground between yourself and the character. That becomes even more fascinating when the character is so far away from you, as Hank was for me. I did all my academic research into his life, into his circumstances, all of my physical training in terms of changing the way I looked and the way I sounded, but then to a certain point, the challenge is to commit yourself to experiencing the intensity of his emotional life—his joy, his pain, his loneliness. That is the actor’s duty, to inhabit those universal feelings through the filter of the character. That’s the fun part. Q: You spent some time with some members of Hank’s family. How that impacted your take on the role? Did they tell you anything that we perhaps don’t know? Hiddleston: Yeah. On the set I met Jett Williams, who is the daughter of Hank and Bobbie Jett. There’s a scene in the film where Bobbie Jett tells Hank that she’s pregnant with his child. Jett was born four days after Hank died. Jett had actually never met her father. She had a very complicated history where she didn’t actually know she was Hank’s daughter until she was quite old. I can’t remember exactly how old. I think she was in her 20s, or maybe in her teens? The day she came on set we were shooting the scene where Fred Rose takes Hank to Hollywood to see if he wants to get into the movie game, and he doesn’t. It was a short scene, and I think Marc and Lizzie were actually shooting something so I was actually able to spend an extended lunch with Jett. She said it was like looking at a ghost. It was very surreal for her, because I was in costume in the suit and wearing the hat. It was a couple of hours of accelerated intimacy, because I had spent months immersing myself in the life of her father, and I had already played out that scene with Wrenn Schmidt, who plays Bobbie Jett. In my mind I had an idea of who Jett was, in my own head, because I was in character, in a way. So it was an incredibly intimate time and I was very happy to meet her. I got a beautiful letter from her when she had seen the film. I also received a letter from Holly Williams, who is Hank Jr.’s daughter, so Hank’s granddaughter. She wrote me one of those letters you keep forever. She loved it and felt like we’d done her family proud. I remember she just said she was blown away, and her favorite scene was when Lizzie and I sing, “I Saw the Light” to the baby, who is her father, when he was 18 days old. She just loved that scene so much. I breathed a huge sigh of relief when I got that email. When you get approbation and approval from the family, the family whose legacy you’re trying to protect, then that’s really all you need. Q: Audrey and Hank had such a tumultuous relationship. Can you talk a little bit about getting in to the mindset of an early 20-somethings, particularly of this period, and having the pressure of fame and being a celebrity and being a performer? Hiddleston: The great appeal of Marc’s conjecture in the screenplay is that he was drawing together the power of Hank’s songs and the marriage of Hank and Audrey, and suggesting that the genius in his writing and the endear-ability of his legacy comes from that authenticity and that sincerity in those lyrics. In Marc’s mind and in my mind there’s no question that the authenticity of that writing comes from that relationship, largely. They were young, and they were going places and they were energetic, and so I think they fell very deeply in love. But they were poor and they were impetuous and strong-headed and impulsive, and they were the kind of couple that fought as much as they were kind to each other. Hank wouldn’t have become Hank Williams without Audrey, because she had the head for business and she kept him straight and kept him on time and introduced him to various business contacts and his managers and he wouldn’t have got to the Opry without her. At the same time, it was difficult because she wanted to share in that success and he loved her and tried to get her up there with him, and then his producers and band mates would say, your wife can’t sing with us, and he would have to tell her that, and she interpreted that as a huge break in loyalty. It is obviously a very complex and difficult relationship, but it is the center of the film and it’s the center of his songwriting. As you said, they were young. It’s difficult to be young. It’s not easy. I enjoyed playing it very much. Passions run high and the freedom to commit to their passions as an actor was very exciting. Q: Both you and your co-star Elizabeth Olsen have experience doing Marvel films and big blockbusters. Do you find it refreshing to be in a film that’s based on a true story? Hiddleston: (facetiously) Are you saying “The Avengers” isn’t a true story? Honestly I think the interesting thing about this question is that I think for the audience the difference is greater than for actors. Our job, our obligation and our duty is to step into characters and play them truthfully, whether that’s a Norse god of mischief, or a North American icon, and so in terms of that commitment of empathy and psychological excavation, to me there is actually no difference. I’m flexing or exercising the same dramatic muscle. Of course it’s different in process. We were able to go, the three of us down to Shreveport and find real locations and inhabit those locations, without any sort of supplemented green screen or visual effects. So in that regard it’s different. The acting part of it, the extension of compassion and understanding, to me is the same. On “I Saw the Light,” if you wanted to have an opinion on the film, you were on the set. There’s nobody who had a creative influence on the film who wasn’t in Shreveport, in Louisiana, with us, on the day. It was the three of us and Dante Spinotti and the other actors, and if you wanted to have an opinion, you had to be there. With Marvel sometimes, because you’re part of this huge universe, sometimes there are people who have hugely important opinions on the day’s work who can’t be there in person so, decisions have to go through decision making processes of approval which is canceling things down a bit. Q: What was the most challenging song for you to perform? Hiddleston: The most challenging song was probably “Lovesick Blues.” Of all the songs Hank sang, he probably sang that the most, because it was a huge hit for him. He once went up on stage somewhere, it’s on an album called “The Lost Concerts” and he’s about to introduce it and he says (in a southern drawl), “I’m going to play a little song for you. I sang this 13 million and one half times. It’s earned us quite a few beans and biscuits.” It was obviously a real hit maker for him and he sang it with such control and such authority. He really must have done it in his sleep. I had to really accelerate that process. It’s a very technically difficult song. The yodel in it, you’re jumping octaves. So to be on pitch in every note in that song was really challenging and I had days where I felt like I was bashing my head against a brick wall, because Rodney Crowell and I would do take after take after take because if I was rhythmically precise, the pitch was off. If the pitch and the rhythm were right, Rodney would say, “Well you weren’t really feeling it. I lost your sincerity, I lost the twinkle, so can you put that back?” Then I’d have to twinkle and I’d go off rhythm again. That was probably the most challenging. Q: When did you feel like you reached the point where you weren’t worrying about singing so much technically and started to feel the songs instinctively? Hiddleston: It goes back to what I was just saying actually about “Lovesick Blues.” We had to pre-record certain tracks because of the way we were going to shoot them. If Marc was covering a concert performance in that he was going to be cutting from wide shots to close ups to hand held, which meant that we had to be very precise about the musical track, and therefore couldn’t play it live in order for it to cut in, we had to pre-record the tracks, which I would then play and sing along to myself. It would be pre-recorded, so we had to lay down a couple of tracks before we started. They each had to have different atmosphere, because some of them are radio station tracks, some of them are studio tracks, some of them are live concert performances. There were some that came very quickly and very easily to me, and some that didn’t. I recorded “Why Don’t You Love Me?” in an hour. It took me about 10 days to record “Lovesick Blues.” I can’t explain why. Rodney and I used to say that it was like swimming in the ocean, and that I would have to swim for miles and miles through seaweed in order to get to clear water. That’s how it felt vocally, that there would be cracks and strains in my voice, because singing in a physical exercise. It’s a physical thing. Once your body and your resonance and your lungs are sufficiently warm, you can actually get to a place where it feels like you’re up to altitude and you’re finally in control of the airplane, if that makes sense. It’s a fascinating experience for me because I still believe singing is the most naked form of emotional expression. Actors can hide behind characters. Writers can hide behind their writing. Painters can hide behind paintings. Singers are purely open. The reason we revere the greatest singers is because we feel there is a raw power to their transmission and their emotion, whether it’s Johnny Cash or Amy Winehouse or Nina Simone or Hank Williams or whoever it may be. That was challenging, because even though there was a technical discipline to it, in manipulating my baritone voice to sound like Hank’s tenor, there was still a commitment of emotional sincerity, which was really new for me. Q: If you could take home either a costume piece or a prop, what would it be, and why? Hiddleston: I played some beautiful guitars. I didn’t get to keep them, and also, is that a poster? These boots are the real deal. Those boots were made specifically for me and every time I wore them I was like, these are **** kickers. (He points to the boots he’s wearing on the film’s poster.) They were great. I didn’t get to keep the, though. I think they’re probably in a cupboard somewhere.